Spring has sprung, and what better way to celebrate than with some fantastic music? 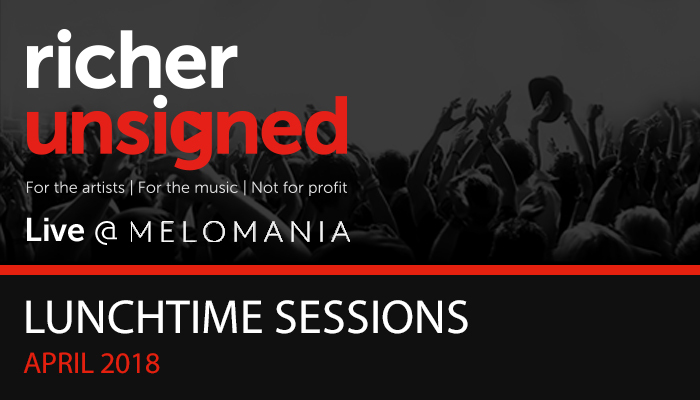 Our monthly Unsigned Session for the month of April saw two more fantastic acts grace the stage at our Melomania venue and they did not disappoint! First up with Fetherstone, the musical brainchild of Briana Cowlishaw. Hailing from Sydney, Australia originally, Cowlishaw’s Fetherstone project takes on several forms, sometimes with a full band, other times as a solo act. We were given the special treat of seeing the first time the project has taken the form of a duo, with Briana enlisting the help of Harriet Langley from Top Cat Collective (who just so happy to be one of our Artists Of The Week). Using a variety of loop pedals and synthesisers accompanied by smooth guitar work, Fetherstone truly blew us away! When we asked for her thoughts on being part of the platform we offer to musicians and band at no cost, she said: “I think it’s amazing. Being an unsigned artist, it’s hard to know how to navigate, how to share your music with people. The thing I loved about Richer Unsigned from the start was that it’s really face value, what you see is what you get. There’s not many companies or organizations out there with that approach.” You can find Fetherstone on the tracklist for our recent Best Of Unsigned vinyl, curated by Newton Falukner! Up next was Lycio, who joined us all the way from Birmingham! We originally selected this dynamic trio as part of our Artist Of The Week program, and we were thrilled to be able to have them through to play an Unsigned Session. This three piece, with singer/lyricist Genny, drummer Alex and Charlie on keyboards/programming, has a sound that’s tailor made for the dance floor, but all played 100% live making for a truly thrilling performance that gave the walls of Melomania a run for their money! Bombastic live drums, electro pop synths and Genny’s unique voice all come together to create something cool and memorable. We asked what the band though of our monthly ‘Best Of’ playlists being played in all 53 of our stores and being featured on a mailing list that has over a million subscribers, Genny exclaimed “That’s pretty big!”, with the rest of the group echoing they thought those were both excellent ways to get their music to potential new fans. As always a big thank you to everyone who joined us for this month’s Unsigned Session, it’s always a treat to share great music with music lovers. See you next month!